Last week I played doctor with a turkey. It was, by far, one of the best cooking experiences ever. I took away the insides, injected the turkey, sewed it's skin, stuffed it... I felt like McDreamy. But let me start from the beginning, because there is a beginning. Last week was the week after thanksgiving, and on Monday, Scott and I went to the store. They were out of almost everything, because like us, so many people were just back from the Holiday and needed to stock up with food. However, they still had a lot of turkeys, and because Thanksgiving was over, they were on sale. It was not my idea to buy a turkey (we had just had lots of turkey the week before), but I (almost) never say no to my fiance. You know, one time I said yes and he gave me a diamond ring, so now I try to always say yes, just in case. For 3 days the turkey was thawing in the refrigerator and I was looking for the best way to cook it. Then I thought that the best turkey I have ever had is the turkey that is roasted at my grandparents' house every Christmas. Besides, as I am not going to be home to eat that delicious turkey this Christmas for the first time in my whole life, so I had to make it myself. My great aunt, la Tia Carmen, used to be the one in charge of making the turkey every year. After she passed away, my grandma and my aunt Isabel took over. Now it's mostly Isabel who makes it, but my grandma supervises her very closely to make sure that everything is perfect. I started by taking the giblets from inside the turkey. 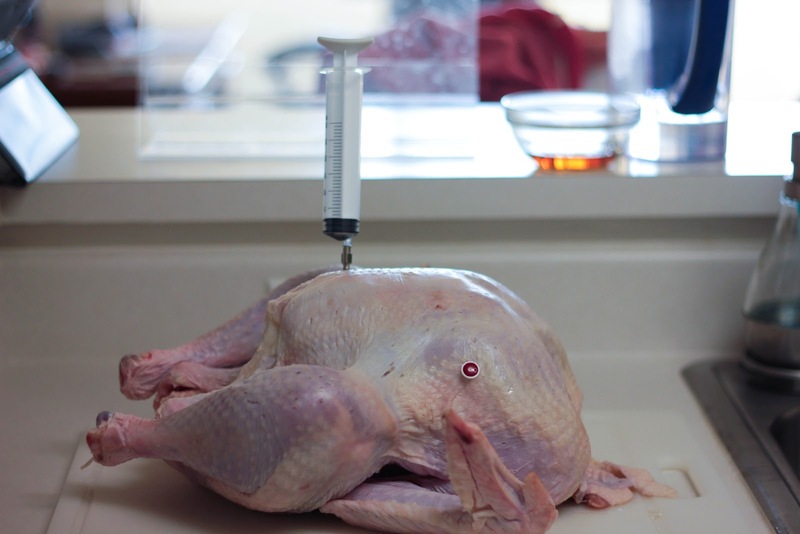 Then I injected it all with brandy. This was so cool, it really felt like being a surgeon in the OR. 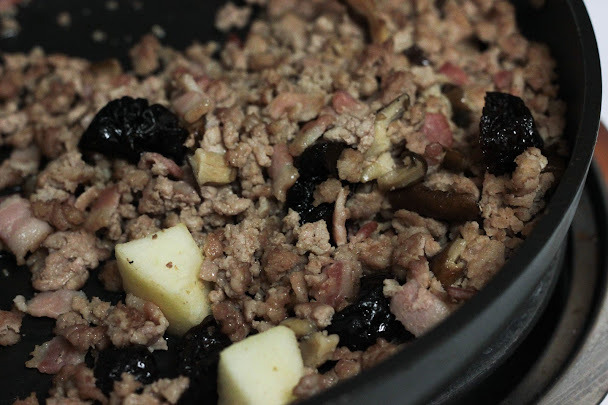 Once injected, I made the stuffing, which is a cooked mix of ground meats, bacon, sausage, apple, and dried fruits. I added some brandy to it too. I stuffed the turkey with the stuffing, which was a lot harder than it seemed. Then, I was told that I had to sew the skin to close the cavity in both the head and tail sides. Here came the CRISIS! I didn't have a needle that was thick enough for kitchen twine (to be honest, I did not have ANY kind of needle). 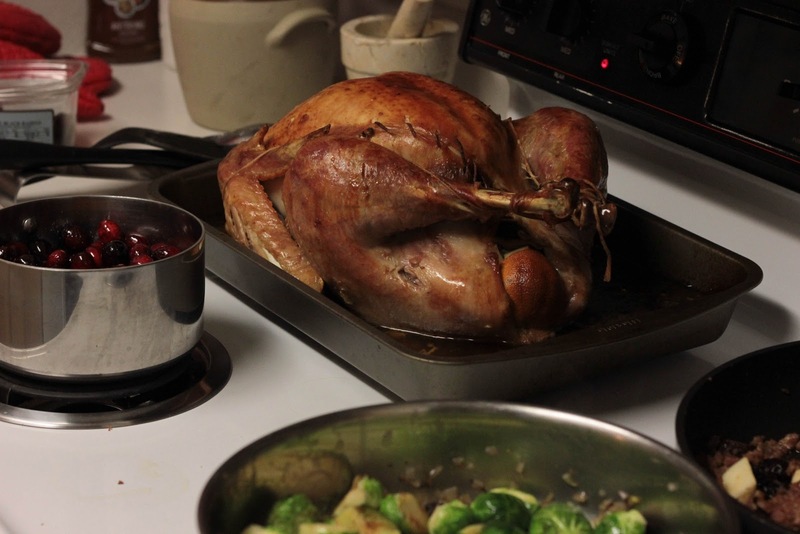 I asked my aunt if I could just not close the bird -what a terrible surgeon I am- but she said no because then the stuffing would come out (kind of like what would happen with real patients if you don't close them up) and would not finish cooking . More CRISIS. She suggested to staple it. I don't even have a stapler! However, I had come this far and I was not going to give up on my Christmas turkey now, plus sewing it would mean more surgeon playing. I used my engineering skills and I came up with a solution. I tied the twine to a toothpick and attached both with tape. I am not kidding. It was a hard task, but the coolest of them all. I must have used at least 10 different toothpicks, as they kept coming out of the thread, or braking. But I did it! I sewed the cavity and it looked good! After that, the hard work as over. I just rubbed the turkey with salt and olive oil and roasted it for what it seemed eternity. It was perfectly cooked, the stuffing was good, the turkey was very tasty and moist. 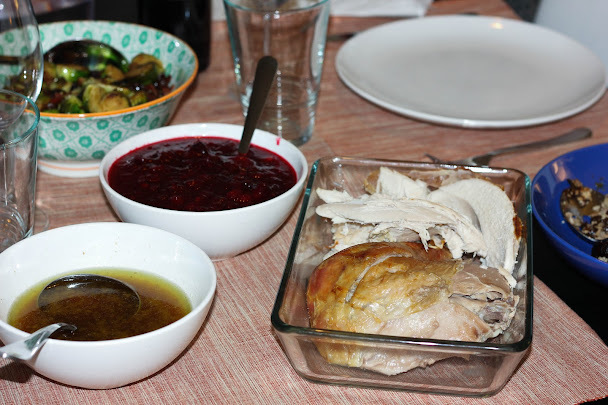 We made cranberry sauce and Brussels's sprouts too. And the turkey the tasted just like the one at my grandma's! Something to really take pride on. 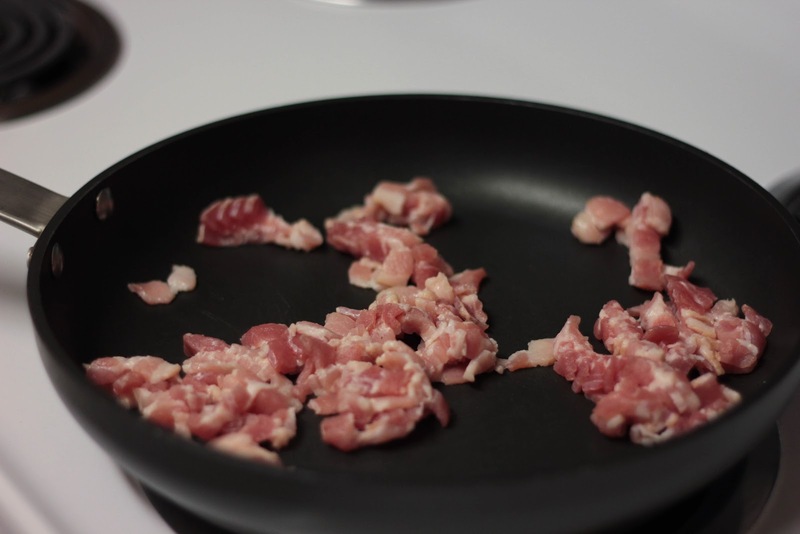 Put the bacon and mushrooms in a big heavy skillet over medium heat. When a lot of fat is released add the sausage and cook for 2 minutes. Add the ground meats and season with salt and pepper. Add the wine or cognac. When it is partially cooked (about 10 minutes), remove from heat and mix in the prunes and the apple. Let it cool. Rinse well the turkey in and out and pat it dry. Add salt and oil inside the cavity, distributing it well. Use an injector to inject the brandy in the turkey's meat, distributing well between the breast and the legs. Stuff the cavity with the stuffing, packing it well inside. You might not be able to fit all of it, depending on the size of the turkey. Using kitchen twine and a thick needle, sew the skin to close both entrances to the cavity. Truss the turkey so that the legs ad wings are tight for an even roasting. 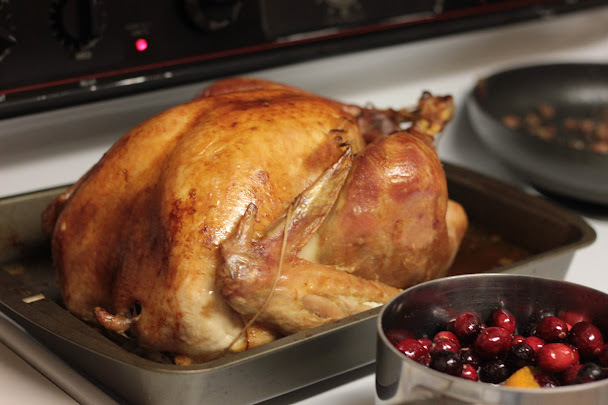 Spread salt and lard (or oil) all over the turkey. Preheat the oven to 375°F (180° C). Put the turkey in a baking pan. Cover the breast with aluminum foil. Roast for 30 minutes. Remove the foil and pour some chicken stock over the turkey, spreading it with a brush. Roast for 2 more hours (or until a total time of 15 minutes per pound of turkey), turning occasionally for an even roast and adding stock every 20 minutes. The turkey will be cooked when the juices come clear when inserting a knife between the thigh and the drumstick, or when the temperature on a thermometer inserted on the thickest part of the thigh reaches 165° F (70°C ). Pour the juices in a bowl and let the turkey rest for 20-30 minutes covered with foil before carving.